Brigadier Yahya Saree said in a press statement on Wednesday that the enemy tried to launch an offensive operation that lasted from the early morning until noon, attacking the positions of the army and the Popular Committees from three tracks, the first towards Yam and Dboua and the Athima, the Sultah and the bark, and the second towards the black hill, Ansab and al-Qarn, and the third towards the hills of Ayash. He pointed out that the Saudi-led coalition with its military warcraft tried to support its forces by conducting dozens of air raids and launching artillery and rocket shells but there was no avail. 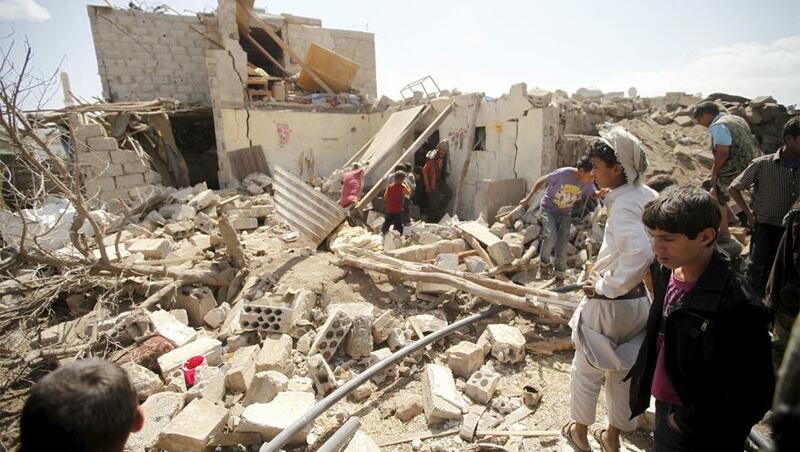 He added that vast groups of the Saudi-UAE militias are still entrapped and that the hospitals of Marib occupied province and the hospitals within the district of Nehm are crammed with bodies of dead and wounded coalition militias. The senior military official said that the infiltrations of the militias of the coalition towards the positions of the army and the committees in the front of al-Baydah were confronted and pushed back by the Yemeni army in support with committees, resulting in heavy losses among the coalition ranks, where dozens fell between dead and wounded while tens of them fled during the clashes. Saree confirmed that those who fled the area of Hamma al-Sodaa were all punished, as coalition warplanes went on targeting them with its raids, which killed and wounded many, including the commander of the battalion Colonel Merzq Salim Haddad. In the west coast, near Hodeidah city, the Brigadier general said that the coalition stepped up its operations, where its militias tried to advance towards the Durayhmi by clashing with the Yemeni army from various regions and for more than 5 hours, pointing out that the attempt was foiled and resulted in the death and injury of more than 55 Saudi-UAE militias, including Sudanese, while dozens of mercenaries fled. In Dhale Yemeni province, “Our forces managed to repel a number of enemy incursions towards the Damtt area, and the enemy suffered heavy losses, as 12 of them were killed and 20 others were injured. The sites where the enemy was deployed were restored in qualitative military operations,” the senior official said. He noted that the coalition militias tried to attack the army’s sites in the front of Jizan, a regional southern Saudi province; however, they were confronted and thwarted from making any advances, which led to dozens of them to be killed and injured. He also stressed the readiness of the army with support by volunteers from the popular committees to confront any escalation by the Saudi-led coalition, giving the full responsibility to the coalition for the ”idiotic” military de-escalation and obstructing the efforts achieved by the international community to stop the war and bring peace to Yemen. Brigadier General Saree said that the coalition intensified its air raids, while its militias on ground stepped up their military operations on a number of fronts at a time when the national delegation arrived in the Swedish capital Stockholm and a day before the start of consultations. During the past 12 hours, the Saudi-led warplanes launched more than 60 air raids26 of them were carried out on the Nehm front and nine raids on the Durayhmi in the coastal province of Hodeidah, causing damage to public and private property and causing the death and injury of many citizens. Here is what you need to know about the Yemeni army forces ahead of the deprature of delegation to Sweden ! Sudan bleeds in participating in the worst humantrian crisis in the world!